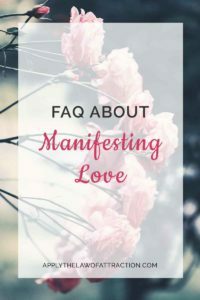 This list of frequently asked questions about my book, Manifesting Love, is compiled from thousands of actual questions I've received in comments and emails since my book was published. I've placed the most popular questions here, in one place, to try to help everyone succeed at manifesting love with a specific person. I hope my answers help you as much as they have helped others. It's not necessary. To attract a specific person, you want to focus on the end result – being in the relationship with him. You don't want to worry about how things will happen. If you find yourself regularly worrying about the smaller details – how your love will contact you, what they will say, etc – that's a sign of resistance. When you're at one with your relationship, you don't doubt whether or not it's going to manifest. You aren't looking around for signs of the Law of Attraction working. You aren't wondering when it's going to happen. You know it's already yours. You're at peace with everything and time is meaningless. You own the outcome so completely that you are at ease. It sounds like you're too attached to the outcome. I suggest you reread chapters 3, 7, 9, and 10 of my book, Manifesting Love. You need to let go of all fear and attachment. Remember the Law of Attraction states your thoughts and feelings have the power to create. So if you're focusing on your fears, that's what you're creating. You are greater than what's going on around you. Focus on yourself and do things that make you happy. That will produce more positive results than worrying about what he is or isn't doing. You can find the story in The Neville Reader. If you're feeling tired, you're trying too hard and using too much mind energy. Manifesting should be fun and energizing. Focus on doing what makes you happy and you should start to feel better. It really comes down to beliefs. Simply, some people believe that you can't attract a specific person with the Law of Attraction. They may have heard someone say you can't and adopted it as their own belief. Who knows. But they believe it and tell everyone that their belief is the only way. Yet, there are stories after stories proving that you can attract a specific person – whether it's stories of attracting love, stories of meeting a celebrity, stories of finding birth parents, or stories of being reunited with long lost friends or family members. 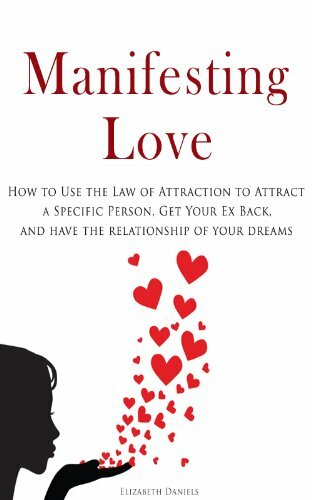 My book, Manifesting Love, uses advanced law of attraction techniques, including a deeper understanding of quantum physics in which you align with the version of you that is already in a relationship with the other person. When you use them, you don't have to worry about free will. Free will is a limited understanding of how the Universe works and only looks at the world from one reality. Manifesting Love is not available as a pdf. You don't need a kindle to read kindle books. Amazon offers free apps that allow you to read kindle books on your computer, smartphone, tablet, and more. You can find the free apps here. I get asked about signs a lot! I wrote an article about it to try to answer the many questions: Ultimate Guide to Signs that Your Desire is Manifesting. If you read the article, you can tell that I ultimately agree with Neville. Don't be concerned with signs from the outer world. They can help ease your mind, but truly all the information you need is within you. It depends on the person. Some people are okay dating other people, some people are not. If you want to be with one person, but you’re thinking about how great another person is, things can get confused and both people can pass out of your life until you get clear on what you want. You need to see what works best for you and if dating causes any resistance or other issues to come up for you. Celebrate your success! You successfully manifested running into your ex and spending time with him! When you see him and become disappointed, you’re sending out negative energy. Instead of seeing it as a failure, you should acknowledge that you have successfully manifested him (you did run into him after all), be grateful and allow more to happen. What if running into him was the first step in having the relationship you want? You had to run into him before more could happen between you. But once you became dejected and started thinking it isn’t working, you should give up, etc., you told the Universe to not bring you the relationship…and it didn’t. Next time, when you run into him, see the positive. Allow yourself to wonder what good could come from the meeting. When you’re truly detached from the outcome, running into him won’t affect you. You’ll know the Universe is still bringing you what you want regardless of outward appearances. Not at all. The most important thing is to feel good. You're manifesting your love when you feel good, even if you're not thinking about your specific person at all. You create everything about your reality. If you believe it's possible, it's possible. This is a clear sign of resistance and attachment! When you're detached from the outcome, you aren't worried about how fast things are happening. You trust that everything is working out for the best and your relationship is coming to you at the perfect time. You are so happy and content that there is nothing to be sick and tired of. When you want things to speed up, you're only creating more delays. When you're wanting your relationship, you're only creating more wanting. I suggest you reread my book and take close notes about what you should and shouldn't do. As I explained in my book, Manifesting Love, it's the Universe's job to take care of the how. Your job is to allow it to happen. If the two of you are together, does it matter how it happened or who contacted whom? You may also want to work on clearing resistance and letting go. The same techniques in Manifesting Love apply, regardless of your sexual orientation. Disclaimer: This article is for informational purposes only. In no way, should any of the information presented be taken as medical, legal, or other professional advice. Neither the author nor the publisher assume any responsibility or legal liability for any damages, losses, or other consequences of any decisions or actions based on the information presented.